I received my fall issue of Entertaining Magazine, by Cooks Illustrated,and it has some lovely recipes which we have been enjoying. I decided to make this one day, but I realized that I did not have the proper ingredients. The recipe required cheddar, and cream cheese, I used brie instead. I also added some apples on a whim. The result was delicious. To prepare I had four chicken breasts, each I tenderized to 1/4 inch thick.. Saute butter, onion, until deep golden brow, add garlic for a few minutes longer. Lie each breast flat, skin side down. Salt and pepper. Spread on thinly sautee onion mixture.Put 1-2 pieces of thinly sliced ham on, add brie, add few thinly sliced apples and now carefully roll into a roll and I used toothpicks to secure. Then I wrapped in foil and refrigerate for at least 45 minutes. This allows everything to set so that you can bread and brown in oil.After 45 min or longer in refrigerator, you then bread each rolled and stuffed chicken breast . You will need 3/1/2 to 4 Cups of breadcrumbs. I make homemade breadcrumbs from a sour dough or a french bread, with salt, pepper. 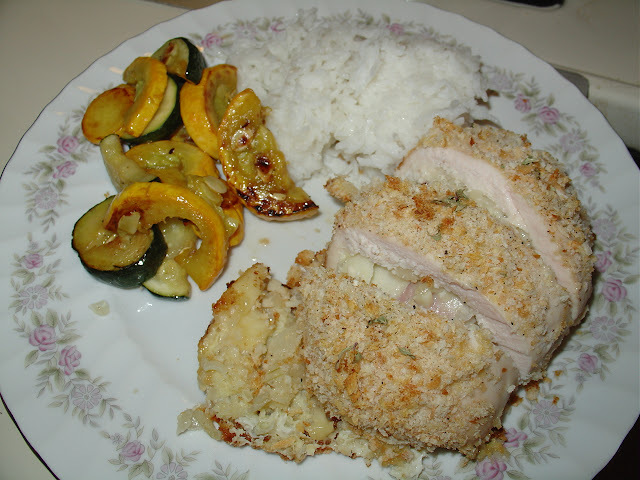 I then rolled each stuffed chicken breast in milk, and then the breadcrumbs and then fried 2-3 minutes to brown each side. Do the same for all the chicken breasts.Bake then @400 for 20 minutes, or longer depending on the size of the chicken breasts. Ultimate Stuffed Chicken From Cooks Illustrated Entertaining Magazine. Fall Issue 2010. 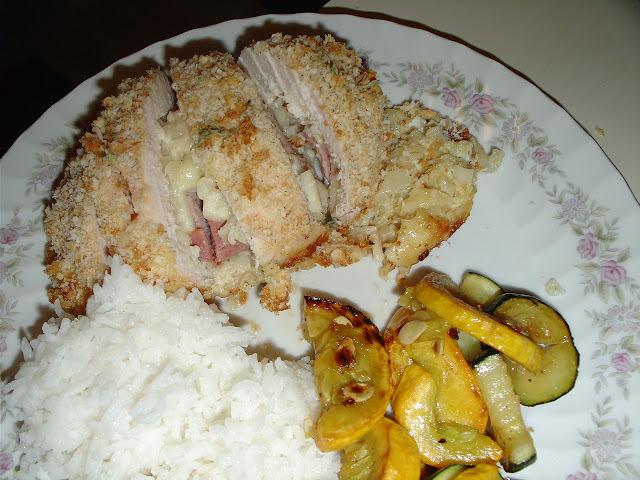 Ultimate Stuffed Chicken with Brie, and sauteed zucchini and squash. 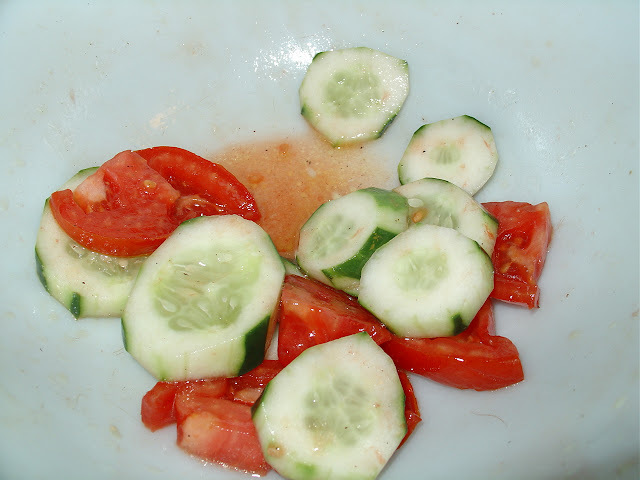 Fresh grown tomatoes and cucumbers from the neighbor.